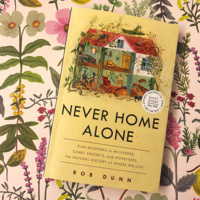 Rob Dunn, Department of Applied Ecology at North Carolina State University, will speak about the stories of the biodiversity in our bedrooms, bathrooms and kitchens, how it is changing and why those changes matter. "We have lived amidst biodiversity for the entirety of our evolutionary history. But recently the species to which we have been exposed have dramatically changed. They have changed, in part, because we have moved indoors where we have attempted to seal ourselves off from the rest of life. In this talk I will tell the story of this transition. I will reveal what we have found living indoors alongside us and also what seems to be missing. Finally, I will explore the consequences of these radical changes." Co-sponsored by CORE Scientific Perspectives. Reception and book signing to follow in Olin lobby.